Fair warning: this recipe is not for the faint of heart, nor those lacking in stamina. This recipe takes commitment and grit. This is a recipe you must bring something of yourself to; it is demanding and time consuming. This recipe will test you. If you’re easily bored it will take you to the brink of madness. It will fight you to your core- but if you stay with it you will be rewarded with fireworks of hearty flavour that will lift your spirits on the saddest, coldest winter day. This is a recipe that vanquishes the very darkness of the soul, and such things do not come for free. Why? This recipe takes 8 hours of work to make. And I mean work: you will be chopping, stirring, adjusting or cleaning the entire time. This isn’t a 1-hour after-work quick fix. 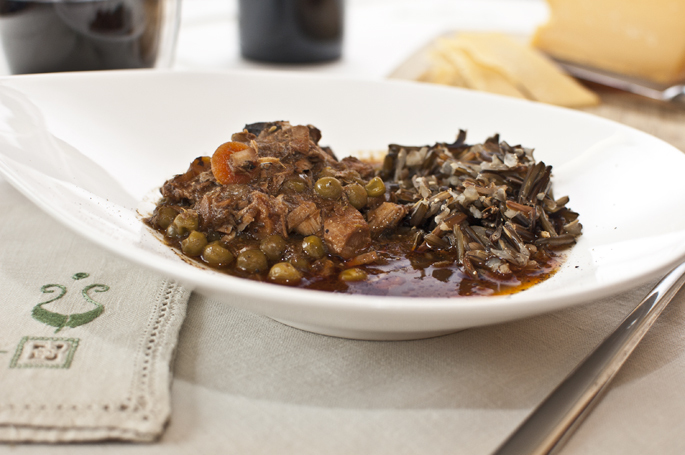 Turkey stew served with wild rice. It’s not exactly health food either: you’re not straining off the fat and throwing it away – you’re keeping it and using it. Oh yes, the fat goes right back in, gentle reader. There. Now that we’ve lost the lightweights, I’ll explain a little bit more about why you should bother putting yourself through this ordeal. Food, after all, is a transient pleasure, and life is short. It’s a flavour orchestra. It combines the basso profundo depths of a sautéed onion base with the tenor of an entire roasted turkey with the contralto sweetness of cloves. Cost-effectiveness. You’ll be eating like royalty for the price of canned soup that you buy off the shelf. It freezes extremely well. Even though this is a large batch, it can stay frozen without consequence for a good 4 months. A small portion will keep you fuelled for hours. Go ahead and chop that wood and carry that water. If you portion this out responsibly you won’t put on weight. You can prepare this recipe in stages. You can roast the turkey on one day, make the stock on the second day, and the main soup recipe on a third. Nothing goes to waste. You’re using the entire animal and only the truly inedible bits get thrown out. If you’re going to kill something, this is more respectful and ecologically friendly. It’s a Stew or a Soup. You’ll get a nice thick stew out of this recipe that can easily be thinned with water if you want to make it go farther. As you can tell from the photo, I go for the stew approach. So, assuming you’re still with me, let’s get started. Strainer. It should be stable when rested on the rim of the cauldron as you’ll be pouring broth through this from one cauldron to the other. 1 medium sized roasted turkey (8 – 9 kgs). Get a range-fed, locally grown bird that’s been raised organically. It’s not only better for the environment but the taste is way better and is worth the expense. Canola oil – assume 4 cups; you may use less. You can use other oils if you like but I find canola oil does not fight with the turkey flavour. This recipe assumes that you are starting with a medium sized free-range roasted turkey. I always coat the top with canola oil and paprika. I usually just follow the directions on the package; there are tons of resources out there on how to get the turkey just right. Needless to say as long as it’s not too dried out it should work, as the entire thing goes into the soup. You heard me– the entire thing. Once the turkey has cooled you’ll need to tear the meat into bite sized pieces, and store in a covered bowl in the fridge. You may feel like a horrifying modern-day Baba Yaga during this process; that’s part of the challenge of this recipe. You’re basically separating the edible meat, which will go into the soup, from the bits of bone and other bits that will go into the stock. You’ll be using the precious roasting pan drippings in the recipe, so save those in a bowl or plastic container as well. Optional: with the cleaver, chop the larger bones open so that bone marrow can escape into the broth. This takes a certain amount of arm strength and definitely is a safety hazard, so take care if you try this. It’s totally worth it though – bone marrow is nutritious and very tasty. Fill one of your cauldrons about ¼ full with water. Add all the bones plus any bit of skin and fat. Peel an onion and chop in half, and add to the pot. Wash one celery stalk and add. In your herb infuser, add about ½ cup peppercorns, ¼ cup cloves, half the Bay leaves and 5 dried chili peppers. Secure to the side of the pot. Simmer for about 4 hours. Allow to cool. Once the stock is at a safe handling temperature, use the spatula to remove all the bones you can, and place in the colander. The colander should be resting in a deep dish or pot so that you can return any drippings to the broth. Place your second cauldron in the sink and place the strainer over it. Pour the broth through the strainer into the second cauldron to remove any fine bones and small pieces of ligament and gristle. Taa-daa! You now have all natural turkey stock. Put the turkey roast pan drippings into one of your cauldrons and set to a medium high heat. Peel and chop the onions into bite sized pieces and add to the cauldron. This can take a while. I have been chopping and adding them to the cauldron one at a time with good results; this gives me time to stir between each onion so they don’t stick to the bottom too much. If needed, add canola oil to the cauldron. You must ensure that there’s enough oil so that as you stir, oil is readily flowing into any gaps. You must have liberal coverage at all times. Once the onions are all chopped, keep stirring, and allow them to stick to the bottom – but not for too long or else they’ll burn. What you’re going for is a thick, glutinous, rich brown residue that is very well cooked but not burnt. When you stir, the residue should deglaze after a couple of passes with the spoon, due to the generous amount of oil you are using. If you’ve never done this before and are nervous about burning, try leaving the mixture to sit for increasingly longer periods of time. It’s not a problem if you stir too soon – you just need to wait longer next time – but if the onions burn it’s game over, and you need to start again with new onions and a clean pot. This process requires a strange combination of courage and caution – you have to be brave enough to let the onions sit, but not so foolhardy that you allow the onions to burn. You’ll know the onions are done by the heavenly smell. The onions will be translucent and will smell like magical roasted goodness. This generally takes me 2 – 2 ½ hours of stirring for this quantity of onions. Transfer the onions to a bowl, and replace the cauldron on the stove. You’ll be doing the mushrooms in this pot next. If there’s any turkey fat left in the onions, feel free to add it back into the pot for the Portobello mushrooms. If needed, supplement with canola oil. Chop the Portobello mushrooms into bite sized pieces and sautée in fat and oil until reduced nicely and smelling wonderful. This won’t take as long as the onions – it will be about an hour. Note: if you’re making the stock and soup in one day, I generally do all this frying while the stock is cooking. Add the fried onions and mushrooms to the broth. Add the remaining paprika, the smoked paprika and the dried savory leaves to the pot. Add the meat, the peas and the carrots (chopped into bite-sized pieces). Allow to cook for at least 4 hours on low heat with the pot lid on, stirring occasionally. There you have it! Serve with wild rice (trust me, the flavour is worth the expense). In spite of my completely bombastic introduction, I really believe you will love this recipe. As always, I would love to hear your favourite ingredients and approaches in the comments below.